last week when I took the boys to their "Well-Child" visit at the pediatrician. Approximately 24 hours after this visit the boys and I became violently ill with high fevers and other issues that shouldn't be mentioned on photography blogs, and approximately 24 hours later my husband was sick. Yesterday I brought Imp to a walk-in clinic (not the pediatrician) and we were told this bug is all over town and is expected to last 5-7 days. Well, I started feeling better yesterday and today everyone is feeling human, if not perfect. My husband was so sick he didn't go in to work yesterday and he never takes sicktime. I was working on the computer and everyone was quiet, so I went to the back part of the house and found all three sickly guys fast asleep in our bed. The boys normally don't nap anymore, and the odds of seeing all three of these guys asleep during the day in the same bed are practically nonexistent. In fact, this type of behavior has rarely been documented. Like most of my favorite images, both photos in this post are just snapshots, but I treasure them because they tell a story of our life in all of its "glory". The storyboard is a new action I am working on right now. It is for making those before/after storyboards, but I wrote it so that you can add an after photo that is not necessarily the same shape/size as your original image (as seen above). 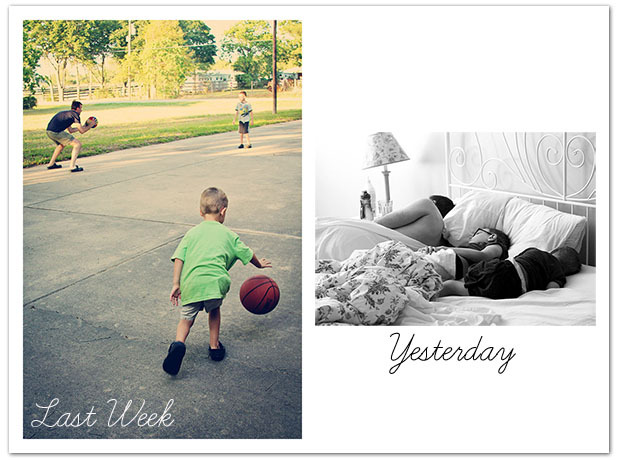 It will add your "after"image, add text which you can edit, and even resizes and sharpens for the web. I will try to post this in the next day or two. 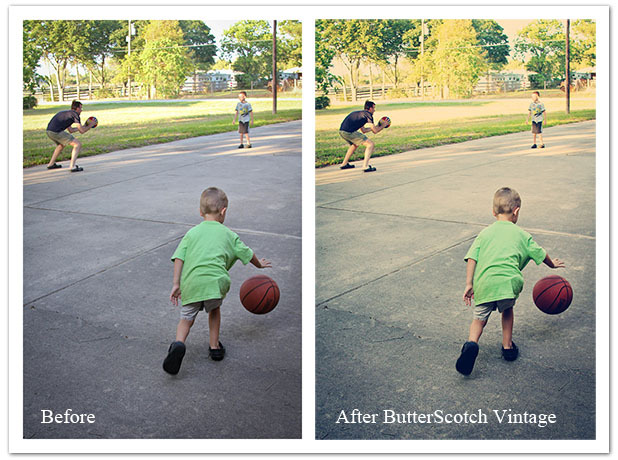 I used ButterScotch Vintage on the left photo, and No Cream or Sugar B&W on the right and the Learning Curve Pro font from Font Squirrel. Hope you are all well and having a great week! Sorry to hear that you all have been sick....get well soon! PS: The photos are priceless...the kind that you look at often. I love your guys curled up together. Hope your family is feeling better soon!